The Web Rotor provides an easier way to navigate a web page with VoiceOver using lists of headings, links, forms and other items on a web page. With VoiceOver running, open Safari. A quick way to do this is to move focus to the Dock by pressing Control, Option, D, use the Left Arrow key until VoiceOver announces the Safari icon is selected, then press Return on your keyboard. Once Safari is running, activate the Web Rotor with the keyboard shortcut Control, Option, U. 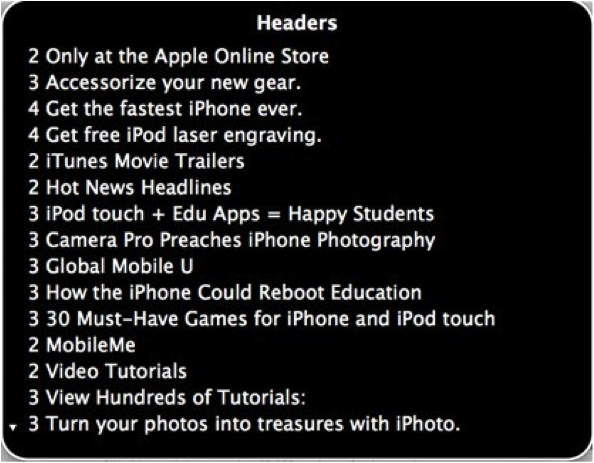 This will open a heads up display with a list of items on it. The first list will include all the headings on the current web page. Press the Right Arrow key on your keyboard to cycle through lists of the other elements on a web page that can be accessed with the Web Rotor, such as images, visited links, tables, frames, and form elements. To navigate the items on a list, press the Up and Down Arrow keys on your keyboard. To make a selection and navigate to a specific item on a web page, such as a specific heading or image, press the Return key on your keyboard while that item is selected in the Web Rotor. To exit the Web Rotor without making a selection, press the Escape key on your keyboard.